I have been working steadily on my argyle color pooling blanket over the past few months and I would like to show you where I am at the moment. Remember were I was last time? I had only done a few rows and used just over 1 ball of Scheepjes Invicta Matterhorn. I have come quite a bit further since that last photo. At this point I have worked just over 5 balls of Scheepjes Invicta Matterhorn, a sock yarn that I am using with a 3mm hook. 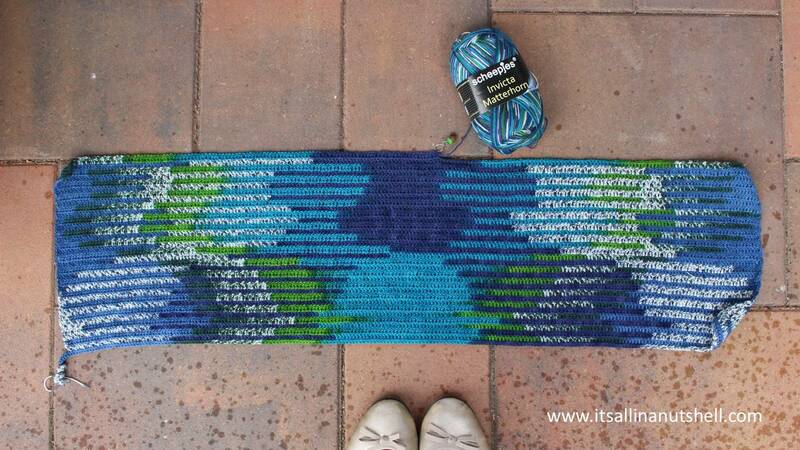 I am also going to add a border using a solid color of the Scheepjes Invicta Extra range. After about 4 balls the argyle pattern started to become very visible. Because of the long color change in the yarn, it is a subtle pattern and not as busy as you might have seen with other argyle patterns. I have come to the conclusion that I am not a robot; I can’t keep my tension 100% constant all the time. This means that my argyle pattern is a little wobbly at times and sometimes shifts over more and sometimes less. As such a slight variation in tension is not a problem, but it accumulates over many stitches meaning that with the long color change of the yarn I have noticed that sometimes my shift is 1 stitch and sometimes 5 stitches. This variation in the argyle shift is what causes my wobbly pattern. Personally I don’t think it’s a problem because it makes my blanket all the more personal and unique. No person on the planet will be able to match my pattern EXACTLY. Isn’t that cool, you can make something completely unique simply by being yourself! Color pooling, or yarn pooling, is popular at the moment and I thought to myself “how hard can it be?” Famous last words right? No, actually it’s not as hard as it looks. I have a detailed description taking you every step of the way. 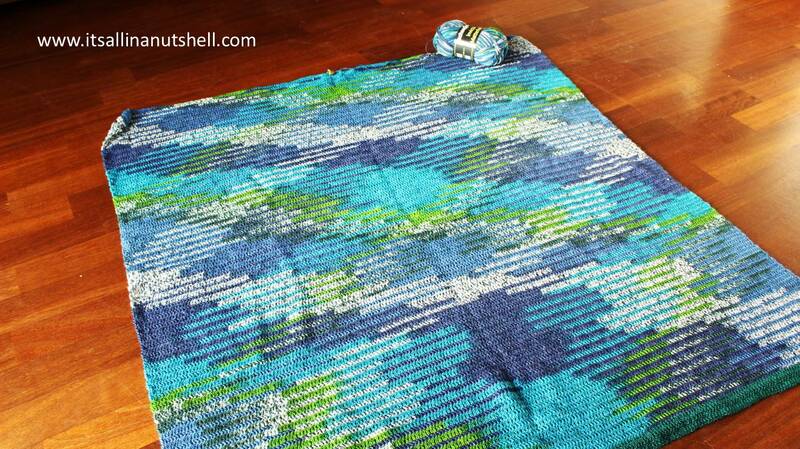 If you prefer, I also have a video showing you how to do argyle color pooling should you want to try your hand at it. Are you doing color pooling? Feel free to share your photo’s on my Facebook page or tag me in your post on Instagram. You can also use #itsallinanutshell to help me find it. That’s very cool. Never tried it myself. OH WOW! fantastic – maybe one day! It’s beautiful! I never tried it (actually until this post I’d never heard of it) I shall watch your video – thank you! Dit is een dingetje voor later 😉. 3 “op de pen” is eerst genoeg. I found an interesting video on how to get the pattern right away. On my phone a Google search on the words below brings the video up as the first selection.